Mixing rhubarb with strawberries is an old tradition probably dating back to the 1800's. Rhubarb was easy to grow in the garden although it likes cooler weather so thrives best in the spring and fall. The sweetness of good ripe strawberries is balanced with the slightly tart flavor of the rhubarb to make for an excellent combination. As with all vintage pie recipes, getting the amount of thickening agent (flour in this case) just right is a bit of a pain. 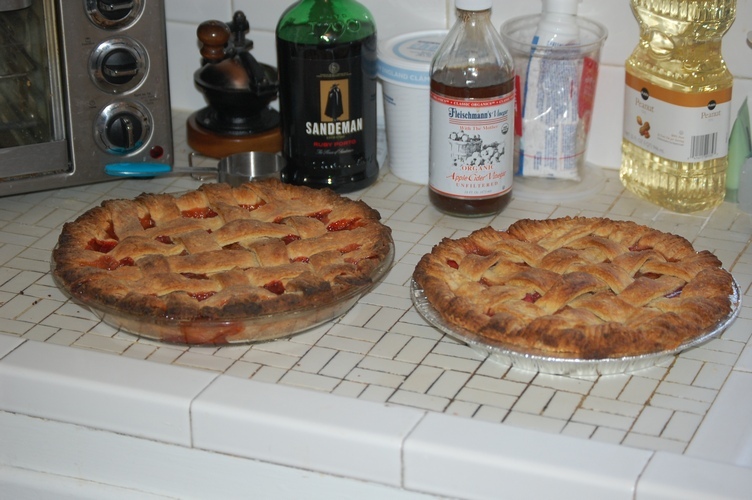 Too little and pie is juicy and doesn't set right, too much and the pie filling is gummy. I think in the old days cooks were able to eyeball the juiciness of the fruit in the recipe and their intuition told them how much thickening agent to use. I highly recommend making your own crust for this or any pie. There is just no comparison between homemade crust and store bought crust. Also if you make your own crust you can add the true secret ingredient of this recipe, orange juice. Just replace the water in the crust recipe with orange juice, in mine I used Indian River Valencia. I was going to shoot a video of how to do a proper and easy lattice crust top but my camera broke so it's going to have to wait until I get a new one capable of shooting video. Make your usual crust recipe substituting orange juice for the cold water. In a bowl add sugar, flour, salt and spices and whisk together. Line a pie pan with pastry and sprinkle in 2T of sugar mixture. Dot with butter then add strawberries and rhubarb. Add in remaining sugar mixture and dot top with more butter. Top pie with a lattice crust and bake at 425° for 15 mins then reduce to 375° for 25 mins more. Let cool thoroughly before serving to ensure that filling sets.